You don’t have to be an HVAC expert to know you have a problem when your furnace is blowing cold air. But, before you start reaching for your wallet and stressing out about major repairs or replacement, consider these five furnace troubleshooting tips. They could save you time and money and turn a catastrophe into a minor inconvenience. 1. Check your thermostat. It sounds too easy, but this is often the problem when the furnace is blowing cold air. Your unit must be set to heat to warm up your home. New “smart” thermostats often have a steep learning curve to operate, but once you are up to speed they are remarkably efficient in saving you money on energy costs. 2. Change the filter. Another easy fix but it is important and often overlooked. Furnaces utilize filters to clean your air and keep dust and debris out of the system. When the filter is clogged the furnace must work much harder to produce the same results. Many furnaces will shut off instead of continuing to fight against a clogged filter. 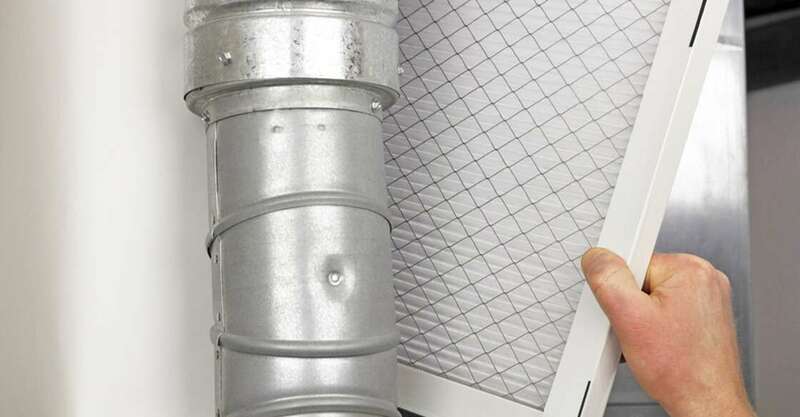 Changing the filter is a quick and easy furnace troubleshooting tip. 3. Check the breaker. Before calling a technician, you can check to see if your unit has power. Often, the breaker is tripped, leaving the furnace inoperable. Open the electrical box, or main service panel, and see if the circuit breaker is tripped, or in the off position. If it is, simply switch it back. Often, this will fix the problem. If your breaker trips every time your furnace kicks on, call an expert to diagnose the problem. 4. Find the “other” switch. Hopefully, you have already run across this other switch or furnace disconnect switch. Furnaces normally have a switch which shuts off power to the furnace, near the unit. It can look just like a regular light switch, but it controls the power to the furnace. They are usually unmarked. If your furnace is blowing cold air, it is possible someone flipped this switch, thinking they were doing you a favor by turning off a light. 5. Verify the Light and Gas. Older furnaces have pilot lights. When they go out, so does your furnace. If your furnace is blowing cold air, it is possible you have no ignition source. Locate your owner’s manual and follow the steps to light your pilot light. It is also possible your gas shut off has been closed. Locate your shutoff valve and open it if it was shut off. Be careful to watch for signs of gas leaks. If you smell gas, seek expert help immediately. Furnaces are complicated devices and often require a certified expert when they need repair. But sometimes the problem is small and can be handled in a few minutes when you are armed with the right information. Take the time to become familiar with your HVAC unit. Know where your breakers, disconnects, and shut off valves are located. Spend a minute with your thermostat to understand how it can be a benefit to your energy conservation. And, perform routine maintenance, such as changing your filters once every month, to prevent unnecessary failures and keep your furnace running strong.